The eighth-century story Beowulf, whose author remains in hiding since this became mandatory reading in many high school English classes, is the great heroic epic of Old English and reflects the mix of pagan traditions and Christianity that characterized northern Europe during the Middle Ages. It also boasts lots of sexually repressed and aggressive blonds. Now this doesn’t make Grendels Mother to happy to have her little head-munching boy ‘off-ed’ by a band of sword-wielding blonds from a Nordic boy band. Grendels Mom proves to be just as nasty as Grendel and Beowulf has to track her down to her lair (a cozy lair with a really nice view) and pokes her with sharp objects until she stops moving. This makes everyone happy and Beowulf rules for another fifty years until a dragon makes dental floss out of him. 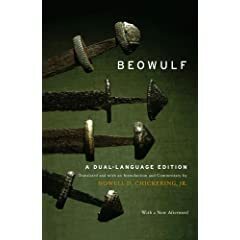 Though Beowulf’s influence on the development of English literature is often overstated (The poem was largely forgotten until the 1800’s) it gained renewed prominence in he twentieth century by inspiring the works of J.R.R. Tolkien . Newer PostCogito, Ergo Sum: Why you think you are? Older PostWhy do we have baby teeth?